The best thing about playing board games is sitting around a table with some beers and playing board games. The worst part is having to learn the rules beforehand. Unnngh, even writing about rules makes my eyes roll over. A good rule book is as important a piece of design as a game mechanic, seeing as it’s vital to the speed and smoothness of a group’s first playthrough, yet so many publishers seem oblivious to this. They’ll omit quick start guides, or write rulebooks out of order in terms of how a turn resolves, and aaahhhhh here we go again my head hurts. One way to fix this is to ask more people to copy companies like Fantasy Flight, who (usually) do a fantastic job with their rules. Another, more elaborate way is for an app like Dized to come in and try and be all the rule books, all at once. It won’t be to everyone’s tastes, I know, but as someone who regularly lives through game nights where one person (Hi Sam!) has a rulebook open on his lap while someone else skips through a YouTube clip looking for a rule clarification, putting all of that in the one app sounds super handy. 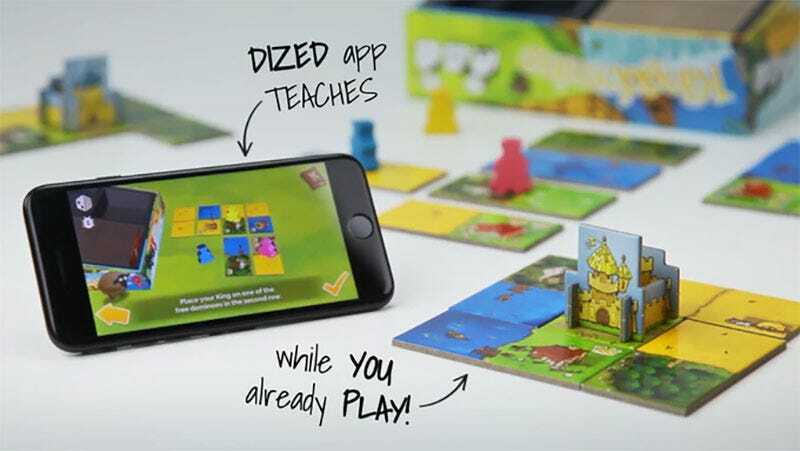 A service like this will live and die on the number and quality of games it supports, of course, but it’s promising that loads of the biggest publishers in board games have signed up to Dized, from CMON to IDW to Stonemaier (there’s a full list here). Some of the stuff available in Dized will be free, but most of it will cost money, with users able to buy individual “game packs” for a single title or pay monthly fees for access to everything on the service. There’s more info at the Kickstarter page. Dized is currently available on app stores but online in limited fashion; the money from the Kickstarter will be fleshing out the roster of included games as the year goes on.